The information about a role is divided into four sections. Role The name of the role. This value must be unique in the system. Description Short but meaningful description of the role. Organization Which organization this role is applicable within. Value System-Wide means that this role is applicable to all organizations defined in the system. This section contains information about permissions included in a role. All—All the permissions available on the other four tabs. Account Management—Access to the account management. Marketing—Access to the data useful for marketing team. Sales data—Access to the data useful for sales team. System Capabilities—Access to the system functionalities. With the list of ‘action on entity’ permissions. With the list of capabilities. The System Capabilities tab lists only capabilities that control access to the system functionalities. Address—A permission that defines whether a user can see drop-down country, address lists when they fill in address forms. 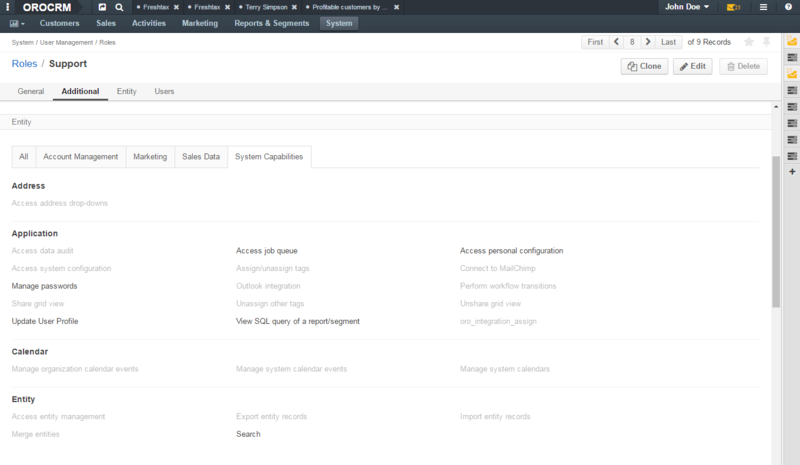 Application—Access to system parts of OroCRM application (job queue, system configuration, etc.) or additional extension of ‘action on entity’ permissions(whether a user can share grid views, change passwords of other users, etc.). Calendar—Access to management of system calendars, etc. Entity—Permissions that define whether a user can import or export entity records, find them via the search functionality, etc. For more information about the system capabilities, see the Capabilities List <./admin-capabilities> . The list of users that have this role. For general overview of roles, see the Roles Management guide. For what actions you can perform with roles, see the Actions with Roles guide. For examples on roles application, see the Access Configuration Examples guide.